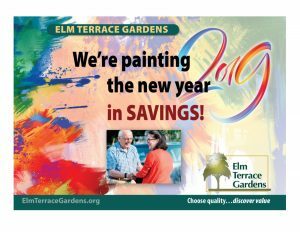 By honoring our mission to serve older adults in a safe, caring, attractive, stimulating and spiritually nourishing environment, Elm Terrace Gardens has earned an excellent reputation. Unlike a for-profit community with a dual responsibility to their residents and shareholders, we are able to focus on meeting the needs of our residents and on being able to provide resident-centered care. In addition to our not-for-profit status, our conservative management and financial stability help ensure that the community continues to thrive and provide services to area seniors for many years to come. We believe that providing services in a mission-driven and value-centric environment attracts caring volunteers, employees and residents who share similar values. For thirty-four years we have provided our services with a personal touch and we look forward to being a stable resource for the community in the future. To apply for a position at Elm Terrace Gardens, please fill out and submit the following form, or call us at (215) 361-5600. Send E-mail to Human Resources. Please leave blank text boxes that do not apply. Elm Terrace Gardens does not discriminate in areas of employment, patient admission, and patient treatment with respect to race, color, religion, national origin, or disability. I am a citizen of the United States of America. I am not a citizen of the United States of America, but I am legally qualified to work in the United States of America. Who should Elm Terrace Gardens contact in case of emergency? Position for which you are making application? I am willing to work part time. I am willing to work full time. I am willing to work as a permanent employee. I am willing to work as a temporary employee. I am willing to work the day shift. I am willing to work the evening shift. I am willing to work the night shift. Please list the skills and attributes you possess which will help you to complete the job for which you are applying. Please describe previous experience you have had working with the elderly? I have previously applied for employment at Elm Terrace Gardens. I have previously worked for Elm Terrace Gardens. I have been dismissed from past employment due to abuse of clients/residents one or more times in the past. I have been convicted of a felony or misdemeanor one or more times in the past. Please list your education below. I graduated from this institution. Please list your last three employers, listing the most recent employer first. ETG may contact for references. All information provided by me on this application is true. Falsification or omission of facts is cause for dismissal. In accepting this application, Elm Terrace Gardens neither states nor implies that an offer of employment will be given. An offer of employment does not contractually oblige Elm Terrace Gardens to continue to employ me in the future. I authorize Elm Terrace Gardens to obtain references from those listed in this application as marked above. I authorize Elm Terrace Gardens to conduct a criminal history check on me. If an offer of employment is extended and I accept it, I agree to abide by all company rules and regulations. For the protection of myself and Elm Terrace Gardens' residents, I will take and pass a physical examination given by Elm Terrace Gardens' Medical Director within the first 48 hours of employment, if hired. I also understand that I must take and pass a TB Mantoux test before employment, if hired. If hired, I promise to keep confidential information about Elm Terrace Gardens which I acquire as a result of my employment.